Thank you for joining me for this amazing tournament report. I had no plans to go to this tournament. This trip was sort of last minute for me. I decided a week previously that I was going and just needed the details planned out. I ended up in a group with seven other people: James Baker, Leon Kornacki, Riad Mourssali, Matt Goslar, Scott Alter, Billy Gogol, and Daniel Sharpy. James’ aunt lives 30 minutes from the tournament site and was nice enough to house and feed eight Magic players. After many changes, we end up with five people in our car for the trip. It was Matt, Scott, Billy, Daniel and I. The trip seemed short and involved watching part of Fight Club and playing a deck-building game on Sharpy’s iPad. I have played Dominion and Ascension and this was just a much simpler version of those. They passed the time and the time flew by. His aunt, Kelly, was amazing. She cooked dinner for all eight of us Friday and Saturday night, along with breakfast both mornings. It was great to start and end each day with an amazing meal. Hopefully I am able to stay there again for future Los Angeles tournaments. I was unsure what I was playing for the Standard portion until a couple days before. I knew I was playing my B/W deck for Legacy but wasn’t sure about Standard. 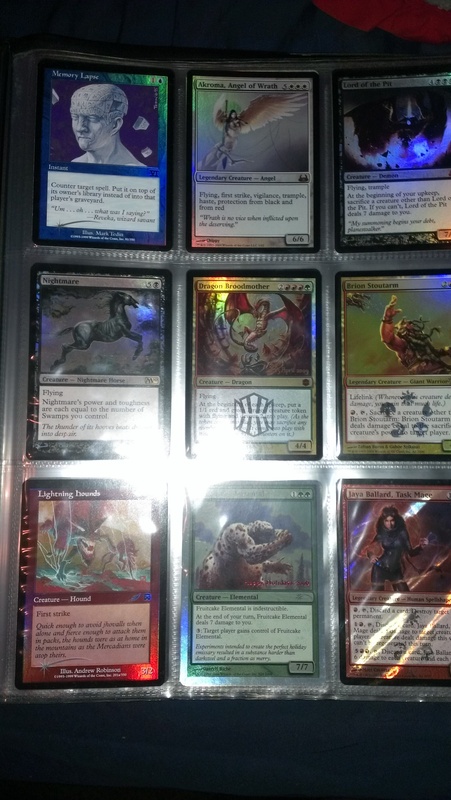 I traded for Esper after a couple friends offered me their opinion that it was the best deck. 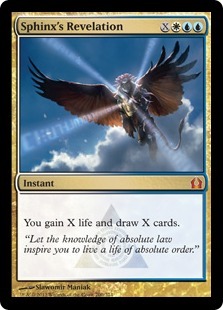 It had the most powerful cards in Sphinx’s Revelation, Detention Sphere and Elspeth. Originally it was the 12 scry land build but I dropped one scry land for an additional Plains to help cast Supreme Verdict on turn 4. This is the list I ended up on. My round one opponent was a nice guy and was playing a deck similar to one that I was debating running earlier in the week. Our game one was quite odd. I keep a hand that had two Mutavault and two scry lands but no quick spells. He ends up taking a bunch of damage with Thoughtseize, shocklands and Read the Bones. I took the Celestial Flare because he was stuck on three lands and my plan was to kill him with Mutavaults. He passes the turn even when he hits his fourth land because he wants to kill one of my Mutavaults when I attack. I decide to just continue hitting my land drops and not attack because it is better for me to let him waste his entire turn. Eventually I kill him with Mutavault by countering his removal and destroying any potential blockers such as Desecration Demon. Our game two started off rough but luckily I had both of my Last Breaths and was also forced to Sphinx’s Revelation for only two. I land Aetherling quickly and use it to help me survive. I manage to draw into a second Sphinx for four cards and once I had a couple of Dissolves I grinded out a few turns and kill him with my Aetherling after drawing the other two Revelations. I take Witchstalker and grind the game out like I’m supposed to. I saved my removal for when he used Rampager or Flesh/Blood and eventually he dies to a combo of Elspeth and Aetherling. Our game two he plays a Witchstalker and I decide to let it attack me while I draw three cards with Revelation. Eventually I Supreme Verdict but he gets a bunch of pressure down on me. 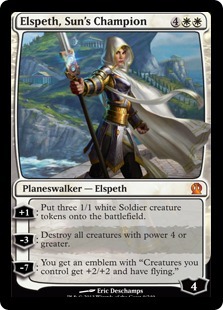 I dwindle down to two life for a while and hold my Last Breath to gain life off my Elspeth token. An important turn was deciding to keep Fated Retribution off a scry land. I had two Supreme Verdicts but kept it anyways. A few turns later, it destroys a 5/5 lethal Mistcutter Hydra and I barely end up winning. Round three I play versus Steven Peters and his R/W Burn deck. This is my worst match-up and I die pretty quickly game one. Game two I land Fiendslayer Paladin but I make a mistake on my Thoughtseize. 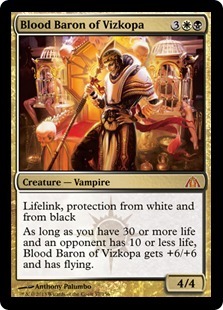 I take Boros Charm over Lightning Strike which he later uses along with a freshly drawn Shock to kill my Blood Baron. If I take the Lightning Strike, then we at least go to game three and anything can happen. A 20% chance of winning is much better than zero. Unfortunately both games he drew at least two Skullcracks and I didn’t see any of my Dispels. This was my first loss and I knew that I could not lose again if I wanted to make Top 8. After discarding a creature to Lotleth Troll, he attacked me for 10 on turn 4 and I saw no removal spells. My heart dropped because G/B can be a rough match up so losing game one is brutal. Game two he is stuck on two land and I easily kill him without a need to Revelation. Game three I manage to survive the early threats and land Blood Baron versus his Corpsejack Menace. He plays Experiment One and a second Corpsejack Menace which turns his Experiment One into a 5/5 instantly. Jace keeps me alive and I manage to find a Verdict after absorbing nine life with Blood Baron. Once I Revelation for five I quickly took over the game and won after two more Revelations. Round five and six were both mirror matches against Mark So and Sam Pardee. In Round five I played out threats and let him counter them and then drew Aetherling turn seven and he was out of counters. Our game two he stumbles on land for a turn and I play my Blood Baron, he matches it, then I play my Aetherling because I know his hand and he only has Aetherling with 5 land in play along with Jace and Dissolve in hand. 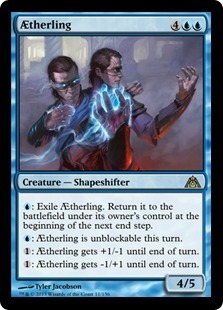 Worst case scenarios he draws a removal or he draws a land and taps out for his own Aetherling. He draws the land and I scry a land to the bottom of my library, -2 Jace and manage to draw a Detention Sphere. Since I only had two blue mana, I was forced to blink my Aetherling, Detention Sphere his Aetherling, and hope he doesn’t draw a removal. Luckily he blanked on his next draw and I easily won. Round six versus Sam Pardee was more of the same. He got mana screwed but managed to beat me game one because neither of us drew Sphinx’s Revelation and he drew the better cards. After boarding in a bunch of counters, he gets mana screwed in the following games. The only other difference being that I am able to take advantage of it by drawing Sphinx’s Revelations and winning quickly with Aetherling. The mirror match is awful when you miss land drops and your opponent is 3-4 land ahead of you. I was sitting at 5-1 and needed to keep winning. My round seven opponent was Chase Werbelow and he was playing Naya. He started off with Voice of Resurgence which I had no Last Breath for. I Detention Sphere it after playing a few scry lands and then he plays another. I end up taking a couple attacks while trying to get to my late game. Unfortunately he Boros Charms me three times and I die a horrible death. Games two and three I manage to keep his board clear and did exactly what the deck was supposed to do with an added addition of Blood Baron from the sideboard. Doom Blade was also great in the matchup because of Boon Satyr and Ghor-Clan Rampager. I was excited to be 6-1 and still in contention for top 8. I’m playing versus Colin Logan and it is my first Mono Black Devotion match of the tournament. Game one he gets Underworld Connection out early and I am unable to keep up with his threats. Losing game one is nerve wracking when you know that you can’t lose again. This happened in most of my rounds after receiving my first loss in round three. Game two I land a Blood Baron and he has no answer to it and then I am able to hold counter magic up for anything he could draw. Game three he stumbles on mana and he is unable to deal with multiple Elspeths so I move on to 7-1 with two rounds to go. Game one I am able to barely survive with Jace, Architect of Thought helping me survive death by Mutavault. I squeak out the win at three life and am super excited to be up a game and possibly being 8-1. Game two is extremely close. 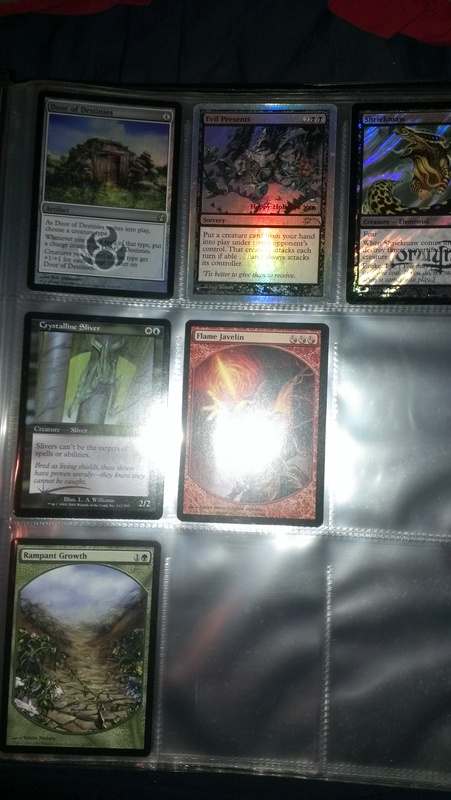 I’m able to keep Ephara and Thassa off the board with Thoughtseize and Detention Sphere. He lands a Master of Waves for 4 with a Mutavault to back it up. I manage a Jace and +1 him. I am able to survive the onslaught and Verdict the board. I’m able to stabilize at 2 life with Elspeth and multiple counters in my hand. Initially I figured it was possible to draw into top 8 but 10 rounds with nearly 700 people meant there were tons of 8-1s and we had to play. Game one was really close. I could not find a Revelation and end up landing a Jace that +1s a few turns but I never draw a Revelation or Supreme Verdict to help get me back into the game. My last ditch effort -2 on Jace hits three lands and I concede. Game two my opening hand had a Plains and Island with nothing exciting. My six cards were similar except it had Last Breath to go along with Revelation. Unfortunately I miss several land drops and essentially was dead after I missed a land three turns in a row. Even before he dropped Blood Baron and Obzedat, I was pretty dead. My death was inevitable yet prolonged due to him forgetting to discard so we had to rewind and each of us shuffled a random card on top, I redrew the nonland and said go (somehow the judge randomly selected the actual card I had drawn). Then we made the 30 minute trip back to our temporary house and prepared for the next day. It was devastating to lose round 10 and barely miss Top 8. I wasn’t upset about getting mana screwed. Multiple opponents of mine lost because they never hit their fourth lands. Mostly, I was sad that I was so close to making Top 8 and having a shot at winning the trophy. I played B/W which I had played a few weeks previously at the monthly AZMagicPlayers tournament. I lost in Top 8 to Bobby Greene who was piloting Tin Fins which is a terrible matchup for me. I end up playing versus him after starting off 1-0 and then drop after getting my 2nd loss round 4. I head home shortly after with 4 other friends from our group of 8. The trip home was entertaining. We stopped for Panda Express and then started back to Phoenix. After watching another movie, we played 20 questions Magic edition where you had to pick a card that was played in Standard at one point in time and take turns asking yes or no questions to try to figure out the card. After playing for an hour, we made it back into town safely. It was great to be back home. I quickly unpacked my blanket and pillow and then was greeted by my loving cat Jackson who acted like I had been gone for a month. After an hour of him rolling around like a dog all over me, he passed out while staying sprawled out on top of me. Overall I enjoyed playing this deck. 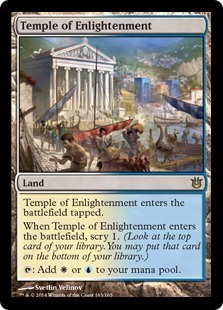 The core blue and white cards are so powerful and the addition of Temple of Enlightenment added to the overall consistency. If I’m not playing a super aggressive deck, then you can bet I will be playing a version of U/W Control. The changes I would make if I were to play this deck would be to take the Fated Retribution out of the main deck. It was great in certain matchups like R/G Monsters, but it didn’t have enough good matchups to take up a spot in the main deck, especially since it costs seven. I loved the Dispel because it helps versus U/W and R/W Burn. R/W Burn is the worst match up. I loved the combination of Blind Obedience, Dispel, Fiendslayer Paladin, and Blood Baron. Dispel on Skullcrack can be a lifesaver. 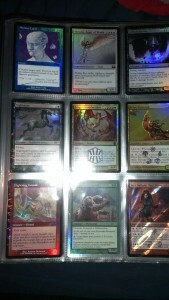 GP Phoenix should be a great time. I will finally meet Helene Bergeot in person. Helene and I exchanged e-mails years ago in regards to the Xbox360 Duels of the Planeswalkers game. Out of the blue she sent me a small binder with a dozen promos. I still have that binder with her letter. She’s always been such a nice person and I am excited to meet her. I will be sure to take some better notes in the hopes that I do well at GP Phoenix but it is hard to focus on writing out all of my plays since I can’t write down each of my starting hands as I draw them. I will have to remember to write down specific turns or write more notes after each round. Overall, I was happy to place 14th out of nearly 700 people. I was disappointed to not Top 8 because that is why I traveled there. It’s hard to be happy about 14th and $100 but I was overall happy with my play and not going into time any of the rounds. It was great practice for GP Phoenix and hopefully Arizona makes a good showing at the high tables. Local Phimus Pan won the Legacy portion on Sunday and many other Arizona players placed well over the weekend. I love our community and how supportive everyone is. There are several great people who lend thousands of dollars in cards to numerous different people in order to help people compete in these Legacy tournaments. 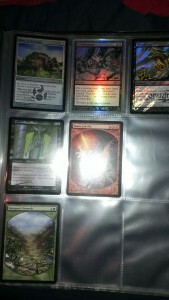 There would be no way I could play in Legacy tournaments without borrowing most of the cards. I hope to see many familiar faces at GP Phoenix or other future events. It was a great experience having someone come up to me and tell me they enjoyed reading my article.